Today, I found a member of The Special Brigade quite by chance. I was looking at a biography of Professor Alexander Robertson of Liverpool University. was the son of Andrew Robertson, farmer and Jane (nde Cantlay). Robertson was one of three children, his twin sisters predeceasing him. His schoolboy education was first at Auchterless School where he was accorded the distinction of Dux and subsequently at Turriff Higher Grade School which he left with the distinction of Dux in 1914. Robertson originally intended to enter farming like his father but his mother persuaded him to further his education and he entered the University of Aberdeen in 1914. Like most Scottish students of the time he took an M.A. degree course, but the subjects he studied were unusual in that there was a preponderance of science. Botany, chemistry, geology, Latin, mathematics, physics, political economy and zoology were all presented at elementary level and in 19 15- 1916 he was placed first in the chemistry class, already adumbrating his later ability. In March 1916 he enlisted in the Special Brigade, Royal Engineers, and was concerned with gas warfare until commissioned in the 2nd Seaforth Highlanders in March 1917. He served at home and in France and after being badly gassed on the Western Front was discharged from the forces in 1918 with the rank of Lieutenant. My great-uncle - Henry John Boyd was a Corporal in the Special Brigade (RE no. 113481). He originally joined the Gloucester Regiment (14004). He was a retail chemist in his pre-war existence. He kept his SB armband all his life. No other details, I'm afraid. Thank you for your post. I would be very interested in his tales. Hi Terry - sorry for taking so long to reply been very busy and away a lot. I recently read the book 'Men of 18 in 1918' - gave me a much better feel for what the times were like when my grandfather served. He was a quiet man and as such I think found the army a tough place, I remember him telling me about the Sgt in the unit he was in (think there were 4 or 5 of them to the motar)- and if you did not get on with him then life was unpleasant and no chance of promotion. he was wounded only once - when under cover of darkness they went into no mans land to prepare to lay down a smoke screen for the infantry who wree attacking the next day - in the dark he fell inot a shell hole and knocked himself out! Came to and waited till the attack took place , hoped they were successful and then made his way back to a dressing station. he did mention many times they fired gas shells , mustrad , phosgene being the ones he mentioned the most. They also used to send over shrapnel bombs , filed with bits of metal , glass whatever they could lay their hands on. He cpmplained amny times of the lice they had, and how they would get into the folds and seams of the blankets, a lighter was the best way to kill them he said. All thru his time over in France/Belgium he got food parcels from the firm he worked for before joining up - Brown Bailey- which was a steel works in Sheffield. On armistoice day he was on leave in Paris , got very drunk on a mix of chepa white wine and benedictine!, nearly fell off an army lorry going up the champs elysee! ps enjoy very much the forum and all the stories it contains.. Many thanks for the insight into your grandfather's service. it is much appreciated. For Andy Heaton and Peter Hodgkinson, I have replied to you both off forum. Interests:Researching Sawtry WW1 Memorial and any Sawtry men who served in the conflict. Hello, Terry - I am just starting to do some research for a friend of mine who had a relative serve with "3rd Batt Spec. B RE". He was Herbert Jagger,born 1883, enlisted Pontefract 3rd Jan 1915 into KOYLI with serial 20837. He arrived in France on 22nd April 1915. At some point he was transferred to the Special Brigade, and re-numbered 147178 rising to the rank of Sgt. He was wounded (possibly on 25th April 1918 - during the German Spring Offensive) and received a pension as a result of it. He was discharged on 30th December 1918, and died in 1965. Hope this is of interest, and if you can throw any light on where and what Sgt Jagger might have been doing on 25th April 1918 I would be very pleased to hear of it, and indeed anything at all about the 3rd Bn. Many thanks. Thanks for the information. I have not found any trace of his service record unfortunately, however, he would have served in either J, K L or M Special Companies whose war diaries are held at the National Archives. The chances of him being named are quite slim, but the diaries are worth investigating. Out of interest, do you know what his pre-war occupation was? Hello Terry - Many thanks for the info re Herbert Jagger, and in response to your 'out of interest' here are the details from the 1911 census on him. I imagine that without knowing which Company he was in and therefore which War Diary to consult it will not be possible to pinpoint just whereabouts he was when he was wounded. Thanks for the information. It is difficult if you can't pinpoint his company, however they are all worth checking, just in case. Other GWF members pointed me to this thread as I had posted similar asking for any info on Special F Company RE. Frederick Arthur James Beck, Born Ormsby Norfolk, Enlisted Great Yarmouth Norfolk, Pioneer 128685 F Special Company Royal Engineers, formerly 22819 Norrfolk Regiment, Died of wounds 4/11/17, Buried Coxyde Military Cemetery. If you can give me any info about F Company and /or what they were up to prior to and on 4th November 1917 I would be interested. I know this is an old post but FAJ Beck was my great-uncle. My father showed me his name on the post office memorial as a child. Unfortunately, FAJ's brother -- my grandfather -- was apparently much troubled for years by the loss of his older brother and destroyed most of what record there was of FAJ out of grief. There was, though, a photo of FAJ in uniform displayed in my grandparents house until they died n the early 1970s. As far as I am aware, FAJ was indeed a postman, though I can't explain why he's not in the staff books. My sister has a photo and his medals. Unfortunately that's about all I know, so if you've discovered further information I'd very much like to hear from you. Hi Terry, just came across your most interesting thread whilst researching a relatives medals that I have acquired. 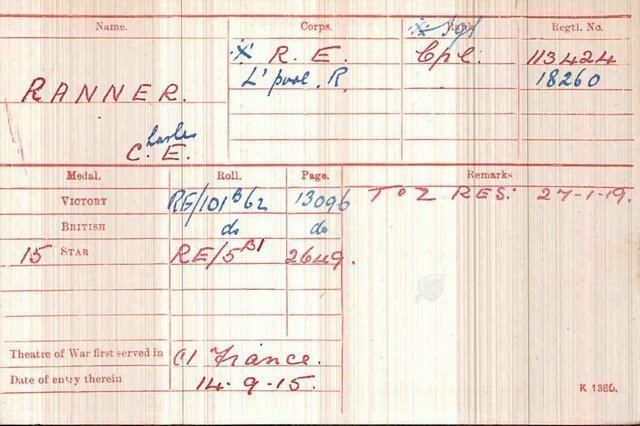 His name was Charles E Ranner 113424 M.M. (Bar) , R.E. I have attached copies of his MIC and MM cards, showing that he was attached to 'F' company Special brigade. Just read both "gas" and Chemical Solders. Interesting books, the latter very critical of Foulks action as head of the Special Brigade. Could find no mention of actions relating to the MM awards, but there is a mention of a lad called 'Renner' in the Chemical solders book. Hoping to enlist the help of a Friend to maybe further research the MM awards. Not holding out much hope but you never know. Further a link to my last a copy of the MM card showing 'f' Special company and the dates of both MM awards. Also a link to the medals themselves. It might be worth exploring to if his awards are mentioned. Another avenue of approach is his home town newspaper which may mention his awards. I would be interested to hear if you find anything out. Good luck. That's interesting, they cover the period of both awards. I have put in a request for a copy of the whole diary. Well a dead end on the National Archives. They have turned down my request for a copy of the unit diary. Don't really give a reason but to say that it will take more than 20 mins to research. Kind of poor since I supplied them with the relevant details. So at a dead end, I plan to be in the UK sometime in July, maybe then I can move closer to a result. I am not absolultely sure if my man was a member of an RE Special Brigade, but I am leaning towards that opinion. Hopefully you can help me out. Henry John Elliott Gale, MC, MM (RE) was k.i.a. 8.6.18 and is buried in the Aire Comunal Cemetary. His MIC shows him as corporal #113366. Sjt. Gale was gazetted for a MM 12.3.17. He was promoted to 2/Lt. (temp.) 7.6.17. Gazetted for his MC 4.2.18. His MC citation reads, ...."during a trench mortar GAS bombardment of the enemy trenches, a gas bomb exploded and filled the trench with gas. Realising that the gas would penetrate to the infantry dug-outs, he warned them to put their respirators on. Although he was gassed, he carried out his work and brought his mortars into action during very heavy enemy shell fire". So it would seem Gale was definitely involved with the REs in a chemical weapon capacity. He was from Cardiff (52 Stacey Rd.). His CWGC details show him as "1st Special Coy." Age at death 23. Do you have any additional information on Lt. Gale? Yes, he certainly was a Special Brigade man - was in 1st Special Company (Mortar) Royal Engineers. I have parts of the war diary from the beginning of May 1918, and before his death he receives a couple of mentions in the diary. I'm afraid I don't have anything more biographical details on him beyond what you already have though. Thank you Steve for the confirmation. THis is exciting news! He originally enlisted into 11th Bn , The Welsh Regiment, and was a school teacher by profession. He transferred to the SB on 28.8.1915. He was commissioned 7.6.17. He was wounded twice: on the 1.8.17 (at duty) and again on 1.12.17 (gassed). As you know, was killed the following year. Thank you very much for this information. I have owned his osd jacket for many years (per- Forum, even pre-internet) but have only recently identified the man who owned it. Suprisingly, it was neither thru the Forum nor the internet that I discovered the owner's identity but rather by chance while thumbing thru "Officers Died in the Great War". The jacket's tailor's label has (as is often the case) a name written in ink which is very faint and sweat stained. However there are both a MC and MM ribbon on the chest. Lt. Gale was the only RE officer listed who had both an MC and MM. Once I had his name from ODGW, the name on the label became rather easy to decypher. Did the Special Brigade have a 'battle flash'? In one of the jacket's pockets I found some black and red melton patches which seem to jibe with thread remnants and 'puckering' on the sleeves? Can you point me in a direction where I might find a photograph of Lt. Gale? Again, thank you for your kind help. It is very exciting for me to have all this information come flooding it after so many years of wondering about who the jackets owner was and what was his fate. He was wounded twice: on the 1.8.17 (at duty) and again on 1.12.17 (gassed). As you know, was killed the following year. I'm guessing that the dates he was wounded were the date that he earned his MM (gazetted 3.12.17 after wounded 1.8.17) and MC (gazetted 4.2.18 after gassed 1.12.17). What details does his card show? I assume you have downloaded it from the national archives. Why not post a copy on here? Interests:The Great War - Mostly the land war - Mostly the German side - Mostly the Western Front Especially: Flame throwers, Special formations; Pioniere Sturm=Truppen Jaeger, usw. Terry will know better, but I believe that the Special Brigade did take in a good number of men from the pharmacutical field, making a number of them corporals at the front end. It is quite possible that he did serve with the Special Brigade although I can' say with certainty. Although originally the call for men in this area specified men with experience in chemistry, this was found to be unnecessary, even before the change from Special Companies to the Special Brigade. The recruiting organisation however, continued to assign men with experience in chemistry, even after the introduction of conscription. This included pharmacists and even pharmacists assistants, that is, chemist shop counter- staff in modern terms, to the Brigade. His background would certainly have made him a candidate, and his rank of pioneer and his number also places him in 1916, which is the time the Special Companies were expanded into the Special Brigade. His service record appears not to have survived, but it might be worth having a look at the newspapers in his own locality, to see if there is a mention of him. Address and map reference: St. Patrick's Close, Dublin 8. Map reference: O 151 335. Position: Wall of north aisle. Position: Present position not known. Description and dimensions: Brass plaque. Height approx. 140cms, width approx 70cms. Recorded by: Michael Pegum, about 1980. Whilst you can't trust everything that appears in the press, Henry Gale is mentioned several times in the local Cardiff papers, following his death. The Western Mail 12 June 1918 says he joined the Cardiff Pals (11th Welsh) in September 1914, later transferred to RE (Special Co) and went out to France in 1915. It also records that he won his MM for services rendered to the Canadian Army at Vimy Ridge in January 1917 and the MC for conspicuous bravery at Cambrai in December 1917 where he was severely wounded and gassed. Commissioned in the field 7 June 1917. He was an assistant master at Roath Park Council School in Cardiff. The South Wales Daily News (15 October 1918) reports the presentation of his medals to his father Walter Gale. It says he was a segeant when he won the MM and saved the lives of a large number of Canadians and also refers to his winning the MC at Arras. The Western Mail 7 June 1919 mentions No 1 Special Coy RE. He's commemorated on the Roll of Honour for employees of the Cardiff Corporation in City Hall, Cardiff. I also happen to know that he attended Cardiff Municipal Secondary School (Howard Gardens) and was commemorated on the memorial there but the school no longer exists and I don't know what has happenned to the memorial.